Established on 24 January 1964, the unit conducted strategic reconnaissance missions in Republic of Vietnam (South Vietnam), the Democratic Republic of Vietnam (North Vietnam), Laos, and Cambodia; carried out the capture of enemy prisoners, rescued downed pilots, and conducted rescue operations to retrieve prisoners of war throughout Southeast Asia; and conducted clandestine agent team activities and psychological operations. The unit participated in most of the significant campaigns of the Vietnam War, including the Gulf of Tonkin incident which precipitated American involvement, Operation Steel Tiger, Operation Tiger Hound, the Tet Offensive, Operation Commando Hunt, the Cambodian Campaign, Operation Lam Son 719, and the Easter Offensive. The unit was formally disbanded and replaced by the Strategic Technical Directorate Assistance Team 158 on 1 May 1972. "to execute an intensified program of harassment, diversion, political pressure, capture of prisoners, physical destruction, acquisition of intelligence, generation of propaganda, and diversion of resources, against the Democratic Republic of Vietnam. These operations (OPLAN 34-Alpha) were conducted in an effort to convince that nation to cease its sponsorship of the communist insurgency in South Vietnam. Similar operations had originally been under the purview of the CIA, which had carried out the emplacement of agent teams in North Vietnam using air drops and over-the-beach insertions. Under pressure from Secretary of Defense Robert S. McNamara, the program, along with all other agency para-military operations, was turned over to the military in the wake of the disastrous Bay of Pigs Invasion operation in Cuba. Colonel Clyde Russell (SOG's first commander) had difficulty in creating an organization with which to fulfill his mission since, at the time, United States Special Forces were unprepared either doctrinally or organizationally to carry it out. At this point the mission of the Special Forces was the conduct of guerrilla operations behind enemy lines in the event of an invasion by conventional forces, not in the conduct of agent, maritime, or psychological operations. Russell expected to take over a fully functional organization and assumed that the CIA (which would maintain a representative on SOG's staff and contribute personnel to the organization) would see the military through any teething troubles. His expectations and assumptions were incorrect. The contribution of the South Vietnamese came in the form of SOG's counterpart organization (which used a plethora of titles, finally ending with the Strategic Technical Directorate [STD]). After a slow and shaky start, the unit got its operations underway. Originally, these consisted of a continuation of the CIA's agent infiltrations. Teams of South Vietnamese volunteers were parachuted into the north, but the majority were captured soon after their insertions. Maritime operations against the coast of North Vietnam picked up after the delivery of Norwegian-built "Nasty" Class torpedo boats to the unit, but these operations also fell short of expectations. This second reported attack led President Lyndon B. Johnson to launch Operation Pierce Arrow, an aerial attack against North Vietnamese targets on 5 August. Johnson also went to the United States Congress that same day and requested the passage of the Southeast Asia Resolution (better known as the Gulf of Tonkin Resolution) asking for the unprecedented authority to conduct military actions in Southeast Asia without a declaration of war. Johnson's announcement of the incidents involving the destroyers did not mention that SOG vessels had been conducting operations within the same geographic area as the Maddox immediately before, and during, that cruise. Neither did he mention that on 1 and 2 August Laotian aircraft, flown by Thai pilots, had carried out bombing raids within North Vietnam itself or that a SOG agent team had been inserted into the same relative area and had been detected by the North Vietnamese. Hanoi, which may have assumed that all of these actions signaled an increased level of U.S. aggression, decided to respond (in what it claimed as its territorial waters).c Thus, the three P-4s were ordered to attack the Maddox. The second incident, in which Maddox and Turner Joy were claimed to be attacked, never took place. though some confusion reigned at the time of the second attack, the facts were clear to the administration by the time it went to Congress to obtain the resolution. When confronted by Senator Wayne Morse (who had discovered the existence of SOG's 34-Alpha raids), McNamara lied to him, stating "Our Navy played absolutely no part in, was not associated with, and was not aware of any South Vietnamese actions." Yet both Commander in Chief, Pacific Command (CINCPAC) and he were well aware of the possible connections, at least insofar as they might have existed in the minds of the Hanoi leadership. These events were not disclosed until the publication of the Pentagon Papers in 1970. The last aspect of SOG's original missions consisted of psychological operations conducted against North Vietnam. The unit's naval arm picked up northern fishermen during searches of coastal vessels and detained them on Cu Lao Cham Island off Da Nang, South Vietnam (the fishermen were told that they were, in fact, still within their homeland). The South Vietnamese crews and personnel on the island posed as members of a dissident northern communist group known as the Sacred Sword of the Patriot League (SSPL), which opposed the takeover of the Hanoi regime by politicians who supported the People's Republic of China (PRC). The kidnapped fishermen were well fed and treated, but they were also subtly interrogated and indoctrinated in the message of the SSPL. After a two-week stay, the fishermen were returned to northern waters. This fiction was supported by the radio broadcasts of SOG's "Voice of the SSPL", leaflet drops, and gift kits containing pre-tuned radios which could only receive broadcasts from the unit's transmitters. SOG also broadcast "Radio Red Flag," programming purportedly directed by a group of dissident communist military officers also within the north. Both stations were equally adamant in their condemnations of the PRC, the South and North Vietnamese regimes, and the U.S. and called for a return to traditional Vietnamese values. Straight news, without propaganda embellishment, was broadcast from South Vietnam via the Voice of Freedom, another SOG creation. These agent operations and propaganda efforts were supported by SOG's air arm, the First Flight Detachment. The unit consisted of four heavily modified C-123 Provider aircraft flown by Nationalist Chinese aircrews in SOG's employ. The aircraft flew agent insertions and resupply, leaflet and gift kit drops, and carried out routine logistics missions for SOG. On 21 September 1965 the Pentagon authorized MACSOG to begin cross-border operations within Laos in areas contiguous to the South Vietnam's western border. MACV had sought authority for the launching of such missions (Operation Shining Brass) since 1964 in an attempt to put boots on the ground in a reconnaissance role to observe, first hand, the enemy logistical system known as the Ho Chi Minh Trail (the Truong Son Road to the North Vietnamese).d MACV, through the Seventh Air Force, had begun carrying out strategic bombardment of the logistical system in southern Laos in April (Operation Steel Tiger) and had received authorization to launch an all-Vietnamese recon effort (Operation Leaping Lena) that had proven to be a disaster. U.S. troops were necessary and SOG was given the green light. In November the first American-led insertion was launched against target Alpha-1, a suspected truck terminus on Laotian Route 165, 15 miles inside Laos. The mission was deemed a success, but the operations in Laos were fraught with peril, and not just from the enemy. William H. Sullivan, U.S. ambassador to Laos, was determined that he would remain in control over decisions and operations that took place within the supposedly neutral kingdom. Ambassador Sullivan had the unenviable task of juggling the bolstering of the inept Lao government and military, the CIA and its clandestine army, the U.S. Air Force and its bombing campaign, and now the incursions of the American-led reconnaissance teams of SOG. His limitations on SOG's operations (depth of penetration, choice of targets, length of operations, etc.) led to immediate and continuous enmity between the embassy in Vientiane and the commander and troops of SOG, who promptly labelled Sullivan the "Field Marshal". The ambassador responded in kind. Regardless, MACSOG began a series of operations that would continue to grow in size and scope over the next eight years. The Laotian operations were originally run by a Command and Control (C&C) headquarters located at Da Nang. The teams, usually three Americans and three to 12 indigenous mercenaries, were launched from Forward Operating Bases (FOBs) located in the border areas (originally at Kham Duc, Kontum, and Khe Sanh). After in-depth planning and training, a team was helilifted over the border by aircraft provided by the U.S. Marine Corps (who operated in the I Corps area) or by dedicated South Vietnamese H-34 Kingbee helicopters of the 219th Squadron, which would remain affiliated with MACSOG for its entire history. The team's mission was to penetrate the target area, gather intelligence, and remain undetected as long as possible. Communication was maintained with a Forward Air Control (FAC) aircraft, which would provide liaison with Air Force fighter-bombers if the necessity, or the opportunity to strike lucrative targets, arose. The FAC was also the lifeline through which the team would communicate with its FOB and through which it could call for extraction if it became compromised. 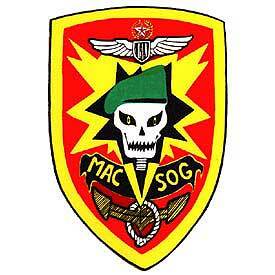 By the end of 1965, MACSOG had shaken itself out into Operational Groups commanded from its Saigon headquarters. These included Maritime Operations, which continued harassment raids and support for psychological operations (via kidnapped fishermen); Airborne Operations, which continued to insert agent teams and supplies into the north; Psychological Operations, which continued its "black" radio broadcasts, leaflet and gift kit drops, and running the operation at Cu Lao Cham; the new Shining Brass program; and Air Operations, which supported the others and provided logistical airlift. Training for SOG's South Vietnamese agents, naval action teams, and indigenous mercenaries (usually Nung or Montagnards of various tribes) was conducted at the ARVN airborne training center (Camp Quyet Thang) located at Long Thanh, southeast of Saigon. Training for the U.S. personnel assigned to recon teams (RTs) was conducted at Kham Duc. In April 1967 MACSOG was ordered to commence Operation Daniel Boone, a cross-border recon effort in Cambodia. Both SOG and the 5th Special Forces Group had been preparing for just such an eventuality. The 5th had gone so far as to create Projects Sigma and Omega, units based on SOG's Shining Brass organization, which had been conducting in-country recon efforts on behalf of the Field Forces, awaiting authorization to begin the Cambodian operations. A turf war now raged between the 5th and SOG over missions and manpower. The Joint Chiefs decided in favor of MACSOG, since it already successfully conducted covert cross-border operations. Operational control of Sigma and Omega was handed over to SOG. The first mission was launched in September and construction was begun on a new C&C to be located at Ban Me Thuot, in the Central Highlands. The RTs inserted into Cambodia faced even more restrictions than those in Laos. Initially, they had to cross the border on foot, had no tactical air support (either helicopters or aircraft), and were not to be provided with FAC coverage. The teams were, therefore, to rely on stealth and were usually smaller in size than those that operated in Laos. aniel Boone was not the only addition to SOG's size and missions. During 1966 the Joint Personnel Recovery Center (JPRC) was initiated. The mission of the JPRC was to collect and coordinate information on POWs, escapees and evadees, to launch missions to free U.S. and allied prisoners, and to conduct post-search and rescue (SAR) operations when all other efforts had failed. SOG provided the capability to launch Brightlight rescue missions anywhere in Southeast Asia at a moments notice. The Air Operations Group had been augmented in September 1966 by the addition of four specially-modified MC-130E Combat Talon (deployed under Combat Spear) aircraft, officially the 15th Air Commando Squadron, which supplemented the C-123s (Heavy Hook) of the First Flight Detachment already assigned to SOG. Another source of aerial support came from the CH-3 Jolly Green Giant helos of D-Flight, 20th Special Operations Squadron (callsign Pony Express), which had arrived at Nakhon Phanom Royal Thai Air Force Base during the year. These helicopters had been assigned to conduct operations in support of the CIA's clandestine operations in Laos and were a natural for assisting SOG in the Shining Brass area. When helicopter operations were finally authorized for Daniel Boone, they were provided by the dedicated support of the Huey gunships and transports of the U.S. Air Force's 20th SOS (callsign Green Hornets). MACSOG reconnaissance teams were also bolstered by the creation of exploitation forces, which could either support the teams in time of need, or launch their own raids against the trail. They consisted of two (later three) Haymaker battalions (which were never used) divided into company-sized Hatchet forces which were, in turn, sub-divided into Hornet platoons. The commanders and non-commissioned officers of these forces were American personnel, usually assigned on a temporary duty basis in "Snakebite" teams from the 1st Special Forces Group on Okinawa. By 1967 MACSOG had also been given the mission of supporting the new Muscle Shoals portion of the electronic and physical barrier system under construction along the Demilitarized Zone (DMZ) in I Corps. SOG recon teams were tasked with reconnaissance and the hand emplacement of electronic sensors both in the western DMZ (Nickel Steel) and in southeastern Laos. Due to the disclosure of the cover name Shining Brass in an American newspaper article, SOG decided that new cover designations were necessary for all of its operational elements. The Laotian cross-border effort was renamed Prairie Fire and it was combined with Daniel Boone in the newly-created Ground Studies Group. All operations conducted against North Vietnam were now designated Footboy. These included Plowman maritime missions, Humidor psychological operations, Timberwork agent operations, and Midriff air missions. Never happy with its long-term agent operations in North Vietnam, SOG decided to initiate a new program whose missions would be shorter in duration, conducted closer to South Vietnam, and carried out by smaller teams. Every effort would also be expended to retrieve the teams when their missions were accomplished. This was the origin of STRATA, the all-Vietnamese Short Term Roadwatch and Target Acquisition teams. After a slow initial start, the first agent team was recovered from the north. Following missions were plagued with difficulties, but, after additional training, the team's performance improved dramatically. 1968 was a black year, not only for MACV but for MACSOG as well. The year saw not only the launching of the largest North Vietnamese/Viet Cong offensive thus far in the conflict, but the utter collapse of SOG's northern operations. Although the Tet Offensive was contained and rolled back, and although significant casualties were inflicted upon the enemy, the mood of the American people and government had turned irrevocably against an open-ended commitment by the United States. For most of the year MACSOG's operations centered around in-country missions in support of the Field Forces. Since the enemy had come out from his cover and launched conventional operations, the U.S. and South Vietnam lost no opportunity in engaging them. General Westmoreland, encouraged by the Joint Chiefs of Staff, requested 200,000 more troops, under the stipulation that they would be used to conduct cross-border operations to pursue his reeling foe. This was the logical military move at this point in the conflict, but it was already too late. Instead, President Johnson sought a way out of the commitment that he had originally escalated. Politically, this was a little late in coming, but Washington had finally woken to the dire predicament it found itself embroiled in. Johnson attempted to get Hanoi to reopen serious peace negotiations and the carrot in this attempt was the cessation of all U.S. operations against North Vietnam north of the 20th parallel. Hanoi had only sought an end to the air campaign against the north (Operation Rolling Thunder), but Johnson went one further by calling a halt to all northern operations, both overt and covert. This order effectively ended MACSOG's agent team, propaganda, and aerial operations. In reality, for MACSOG, the point was moot. Suspicions abounded within the organization that Operation Timberwork had been penetrated by communist dich van agents. The intelligence returns from the northern agent teams had been strangely lax and more than three-quarters of the agents inserted had been captured either during or not long after their arrival. The fact that SOG had slavishly followed the CIA's failed formula for three years was not considered a contributing factor. The unit was more concerned over Washington's continuous rejection of one of the original goals of the operation, the formation of a resistance movement by possible dissident elements within North Vietnam. Washington's stated goal in the conflict was a free and viable South Vietnam, not the overthrow of the Hanoi regime. The conundrum was what would happen if the program had succeeded. The best possible outcome would have been a repeat of the ill-fated Hungarian uprising of 1956, brutally crushed by the Soviet Union, and about which the U.S. could do nothing. Some American writers on the subject (including many ex-SOG personnel) blamed the failure of the operations on the penetration of the unit by enemy spies – a claim not entirely unsupported by fact.i Others, however, laid more of the blame on the operational ineptitude of SOG, which simply continued to repeat a failed formula.j Changes to the infiltration program (in the form of the diversionary Operation Forae), spurred by suspicions at headquarters, had come only as late as 1967. The security apparatus of North Vietnam had decades in which to learn to cope with not only the CIA's program, but with the unconventional and covert operations of its French predecessors. The CIA had been loath to conduct such operations in the north, since similar operations in the Soviet Union, Eastern Europe, and the PRC had been abject failures and North Vietnam was considered an even tougher target to penetrate. North Vietnamese security forces simply captured a team, turned its radio operator, and continued to broadcast as though nothing had happened. Supplies and reinforcements were requested, parachuted in to the requesting team's location, and were likewise captured. During the period 1960–1968 both the CIA and MACSOG dispatched 456 South Vietnamese agents to either their deaths or long incarcerations in northern prisons. Hanoi continued this process year after year, learning SOG's operational methods and bending them to its purpose. In the end, it was running one of the most successful counterintelligence operations of the post-Second World War period. With the deflation of its northern operations (although the JCS demanded that SOG retain the capability of reinitiating them), SOG concentrated its efforts on supporting Commando Hunt, the Seventh/Thirteenth Air Force's anti-infiltration campaign in Laos. By 1969 the Ground Studies Group was running its operations from C&Cs at Da Nang for operations in southeastern Laos and at Ban Me Thuot for its Cambodian operations. That year they were joined by a new C&C at Kontum, for operations launched into the triborder region of the Prairie Fire and the northern area of Daniel Boone, which was renamed Salem House that year. Each of the C&Cs was now fielding battalion-size forces, and the number of missions rose proportionately. Command and Control North (CCN), commanded by a lieutenant colonel, used 60 recon teams and two exploitation battalions (four companies of three platoons). Command and Control Central (CCC), also commanded by a lieutenant colonel, used 30 teams and one exploitation battalion. During 1969 404 recon missions and 48 exploitation force operations were conducted in Laos. To give an example of the cost of such operations, during the year 20 Americans were killed, 199 wounded, and nine went missing in the Prairie Fire area. Casualties among the Special Commando Units (SCUs – pronounced Sues), as the indigenous mercenaries were titled, were: 57 killed, 270 wounded, and 31 missing. Command and Control South (CCS), also commanded by a lieutenant colonel, consisted of 30 teams and an exploitation battalion. Since the use of exploitation forces was forbidden in Cambodia, these troops were utilized in securing launch sites, providing installation security, and conducting in-country missions. During the year, 454 reconnaissance operations were conducted in Cambodia. The teams were ferried into action by the H-34 Kingbees of the South Vietnamese 219th Helicopter Squadron and assorted U.S. Army aviation units in the Prairie Fire area, and by the U.S. Air Force helos of the 20th Special Operations Squadron in the Salem House area. By the end of 1969, SOG was authorized 394 U.S. personnel, but it is useful to compare those numbers to the actual strengths of the operational elements. There were 1,041 Army, 476 Air Force, 17 Marine Corps, and seven CIA personnel assigned to those units. They were supported by 3,068 SCUs, and 5,402 South Vietnamese and third-country civilian employees, leading to a total of 10,210 military personnel and civilians either assigned to or working for MACSOG. The mission of the Ground Studies Group was to support the sensor-driven Operation Commando Hunt, which saw the rapid expansion of the bombing of the Ho Chi Minh trail. This was made possible by the close-out of Rolling Thunder, which freed up hundreds of aircraft for interdiction missions. Intelligence for the campaign was supplied by both the recon teams of MACSOG and by the strings of air-dropped electronic sensors of Operation Igloo White (formerly Muscle Shoals), controlled from Nakhon Phanom.k 1969 saw the apogee of the bombing campaign, when 433,000 tons of bombs were dropped on Laos. SOG supported the effort with ground reconnaissance, sensor emplacement, wiretap, and bomb damage assessment missions. The cessation of the bombing of the north also freed the North Vietnamese to reinforce their anti-aircraft defenses of the trail system and aircraft losses rose proportionately. By 1969, the North Vietnamese had also worked out their doctrine and techniques for dealing with the recon teams. Originally, the communists had been caught unprepared and had been forced to respond in whatever haphazard manner local commanders could organize. Soon, however, an early warning system was created by placing radio-equipped air watch units within the flight paths between the launch sites and Base Areas. Within the Base Areas, lookouts were placed in trees and platforms to watch likely landing zones while the roads and trails were routinely swept by security forces. The communists also began to organize and develop specialized units that would both drive and then fix the teams so that they could be destroyed. 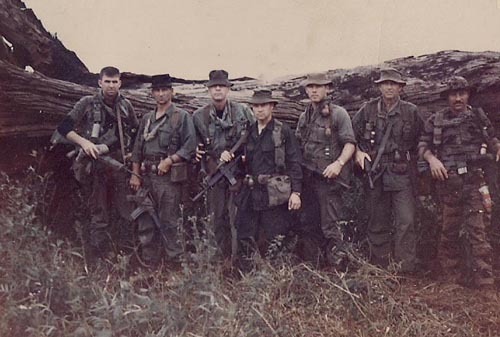 By 1970, they had created a layered and effective system, and SOG recon teams found their time on the ground both shortened and more dangerous. The mauling or wiping out of entire teams began to become a less uncommon occurrence. Since his election in 1968, President Richard M. Nixon had been seeking a negotiated settlement to the Vietnam War. In 1970, he saw an opportunity to buy time for the Saigon government during the phased withdrawal of U.S. troops that began in the previous year. He also sought to convince Hanoi that he meant business. That opportunity was provided by the overthrow of Cambodia's Prince Sihanouk by the pro-American General Lon Nol. Nixon had escalated U.S. involvement Cambodia by authorizing the secret Operation Menu bombings and by the time of Sihanouk's ouster, the program had been in operation for 14 months. Lon Nol promptly ordered North Vietnamese personnel out of the country and then began military operations against them when they refused to leave. Nixon then authorized Operation Rockcrusher, a series of incursions by U.S. and South Vietnamese forces that began on 30 April. With intelligence on communist Base Areas in eastern Cambodia gleaned from MACSOG, huge stockpiles of North Vietnamese arms, ammunition, and supplies were overrun and captured. In May, Operation Freedom Deal, a continuous aerial campaign against the North Vietnamese/Viet Cong and the Khmer Rouge was initiated. SOG recon teams in Cambodia now had all the air support that they needed. As a result of U.S. political reaction, on 29 December the Cooper-Church Amendment was passed by Congress, prohibiting participation by U.S. ground forces in any future operations in either Cambodia or Laos. U.S. participation in Cambodian operations (which were already being turned over to all-Vietnamese teams) ended on 1 July 1970 and the same stipulation was to apply in Laos no later than 8 February 1971 (the only qualifications to the restrictions, in both operational areas, were in case of either POW rescue missions or aircraft crash site inspections). Although unknown to the U.S. public, many MACSOG veterans participated in Operation Kingpin, the Son Tay POW camp raid carried out in North Vietnam on 21 November 1970. The deputy commander of the joint rescue force was Colonel Arthur "Bull" Simons, who had created SOG's cross-border effort in 1965. By 1971 the U.S. was steadily withdrawing from Southeast Asia. As a test of Vietnamization, Washington decided to allow the South Vietnamese to launch Operation Lam Son 719, the long-sought incursion into Laos whose aim would be the cutting the Ho Chi Minh Trail. MACV and the South Vietnamese had been planning just such an operation as far back as August 1964, but the concept was continuously turned down due to the fallout that would have been incurred by the invasion of supposedly "neutral" Laos. The Laotian government (supported by Ambassador Sullivan and the State Department) was adamantly opposed to such an operation. On 8 February, 16,000 (later 20,000) South Vietnamese troops, backed by U.S. helicopter and air support, rolled into Laos along Route 9 and headed for the communist logistical hub at Tchepone. Unlike the Cambodian incursion, however, the North Vietnamese stood and fought, gradually mustering 60,000 troops. By 25 March, the South Vietnamese forces retreated. Ironically, MACSOG's role in the operation was only peripheral. Recon teams conducted diversionary operations prior to the invasion and helped cover the South Vietnamese withdrawal, but they were otherwise forbidden from participation in the very operation that both MACSOG and MACV had come to consider its raison d'etre. Regardless, both the Cambodian and Laotian incursions had spread the conflict, in both countries, to new levels of violence and intensity. In Laos, the North Vietnamese cleared their logistical corridor to the west for security reasons and increased their aid and support for the Pathet Lao. Fighting that once was seasonal became continuous and conventional. The Cambodian genocide began under the PRC-backed Khmer Rouge (also backed by the exiled Sihanouk), took over the conflict against the inept central government. This expansion of conflict displeased the North Vietnamese government, as they despised the Khmer Rouge and had attempted to form their own Cambodian military force.